Vibrant stripes on ultra-long scarves featured at Etro’s Fall/Winter 2015 collection in Milan. With autumn well and truly kicking in – if not temperature-wise, then certainly in a calendrical sense – we thought we’d have a look at what’s happening on the runways for some ideas towards a winter wardrobe. The recent Milan Fashion Week showed some interesting trends: vibrant stripes, exaggerated sleeves (including puffed sleeves and leg of mutton), and ultra-long scarves. All of which seem to come together in these Missoni creations: dramatic, bold and with a mod-ish colour sensibility that will brighten any overcast winter’s day. There’s no reason why your home cannot take a leaf or two from the catwalk, with the addition of a cozy blanket or throw to snuggle under. Now’s the time to start thinking – and making – them before the cold seriously sets in. Australian Country Spinners have many terrific free patterns on their website, including this log-cabin Country Throw. Come in and put together your own palette for a one-off throw that will be treasured and likely handed down through the years. Knit in garter stitch, it’s perfect for the adventurous beginner and an ideal Easter holiday project too. There’s no way we can quote from the late, great David Bowie’s ‘Fashion’ and not include mention of Kansai Yamamoto’s iconic jumpsuit for Ziggy Stardust. Knitter extraordinaire Vicky Howell has charted the Fair Isle pattern, which would work beautifully as a jumpsuit – if you dare. For those who prefer a piece that may have slightly wider application, the pattern would work as well knitted as an ultra-long scarf à la Missoni. We reckon the Starman himself might have approved. At the shop, Karen is participating in a Mystery Knitalong run by Alana Dakos from Never Not Knitting through Ravelry. 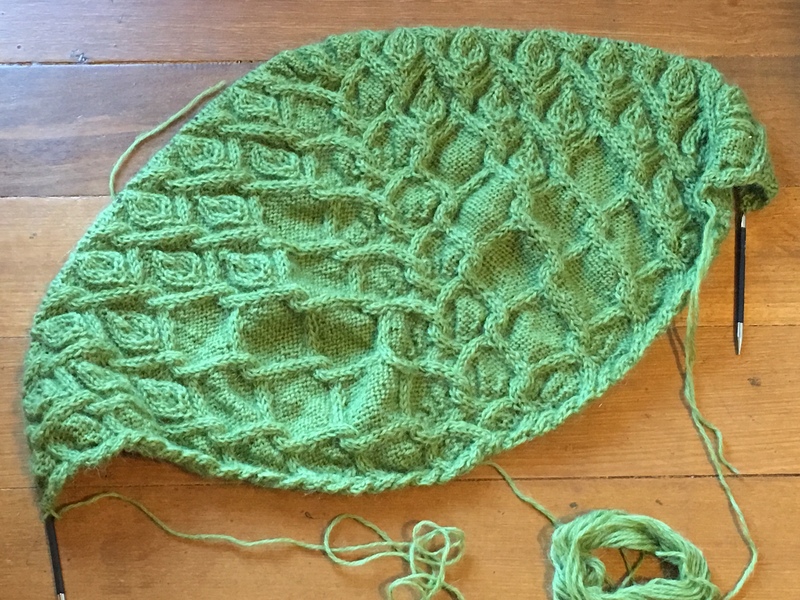 The KAL is over, but Karen still hasn’t finished – and she’s not peeking either, so here’s where she’s at! The shawl is knitted in Rowan Kid Classic. Amy is making a Three Colour Cowl in Zealand Air Laceweight, a study in texture, lace and stripes. I am making a Hinagiku Hat for my daughter’s friend using Cleckheaton’s Superfine Merino in her favourite colour, turquoise. The stitch definition in this yarn is unbelievable. If you are looking for Easter makes, Anette from Lebenslustiger has come up with a cleverly seamed square that turns into a rabbit, with good step-by-step instructions. One softie, two yarn choices. And speaking of Easter, we’ll be closed on the Friday, Saturday and Monday and will reopen at 10am as usual on Tuesday. To finish, here’s a moving story about Canberra prosecutor Paul Sweeney who hands out trauma teddies to kids who need it. His mum Madelene has made thousands of them, which he passes onto children who are experiencing severe trauma. As he said, while a little boy’s world ‘dissolved in sirens and lights’ one night, that boy kept the bear safe – and took him home. Categories: blankets, events, Knitting, Uncategorized, WiP | Tags: knitting | Permalink.